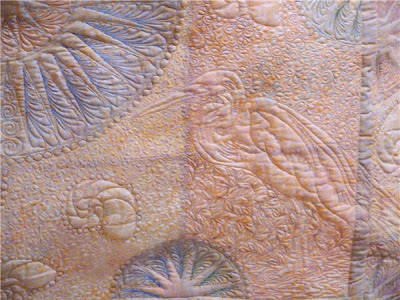 Today I found out that the Venice Area Guilds raffle quilt that I quilted won a second place ribbon at Vermont Quilt Festival. I was quite surprised and very pleased. That, and my computer crashing was my excitment for the day. Tomorrow hopefully will be calmer. I will be going to buy a new computer first thing though. Yeah! I've been waiting all day for you to post this. Congratulations! Congratulations! It's a beautiful quilt! I forgot to tell you that I finally bought the stand like yours for taking photos. It arrived a couple days before I left for Mom's and I haven't set it up yet but did run out to Target to buy the clips to hold the quilt up. What a great quilt! Congratulations! 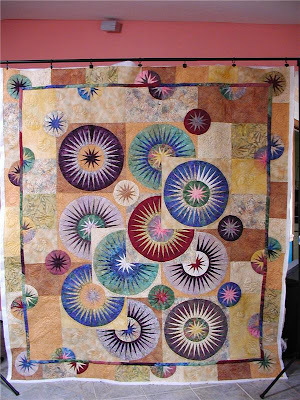 Congratulations...what a beautiful quilt...your quilting is amazing! 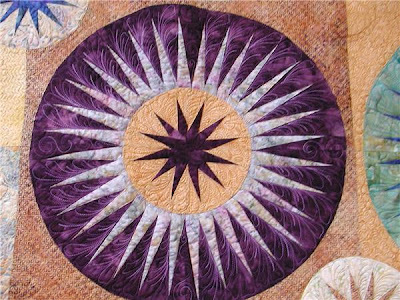 Cngratulations - the piecing and quilting are fabulous. Your quilt is absolutely beautiful!!! Congratulations on your ribbon, it is well deserved!